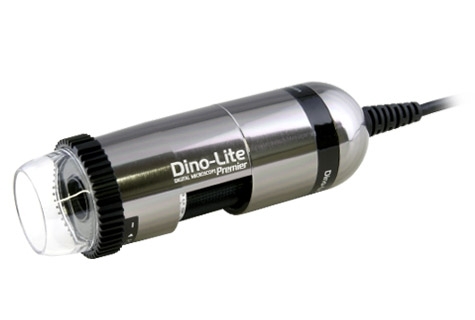 The Dino-Lite Premier AM7013MZT4 digital handheld microscope allows you to see at 430x~470x magnifications with the benefits of adjustable polarization. It has a five Megapixels sensor that allows you to view great detail and capture large images at 2592 x 1944.This model is ideal for situations that require over 400x magnification with polarization yet need the large details of a five Megapixels sensor. The polarization ability allows you to see fine details of surfaces such as semi-transparent materials like; jewelry, skin, glass, or plastic. It is also ideal for examining highly reflective materials, such as metals or solder joints. The polarizer on the AM7013MZT4 can be freely adjusted allowing for different amount of polarization for effective examination. The Dino-Lite Premier AM7013MZT4 is an USB 2.0 device allowing you to digitally examine objects on your computer. It comes with DinoCapture 2.0 software that allows you to take pictures, record video, and annotate on images. Certain models such as this also feature measurement and calibration tools. The AM7013MZT4 is a great tool for high magnification imaging that requires polarization.